As you amble through Corte Madera's genteel Town Centre with its array of oh so nice, Marinish, middle-class stores, you might detect a change in the air. 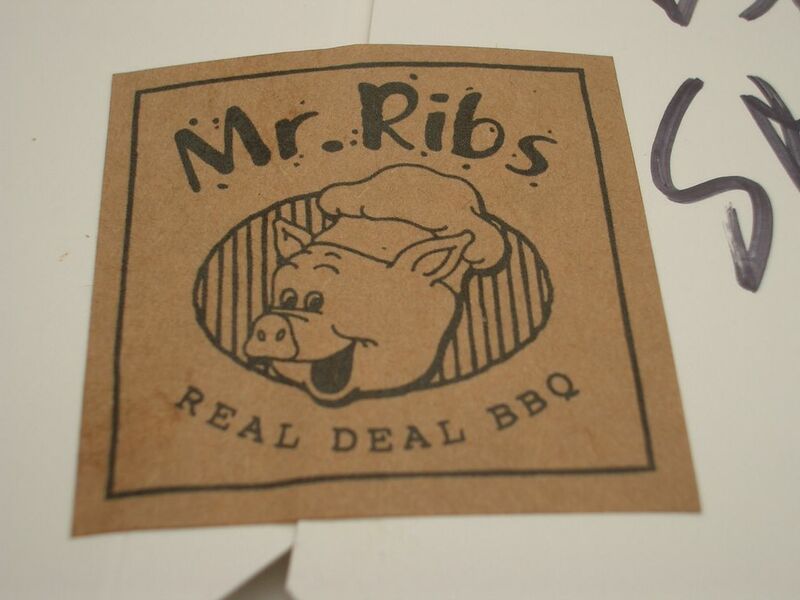 You frown, you ponder, you turn to your companion and ask, "Can you smell BBQ?" 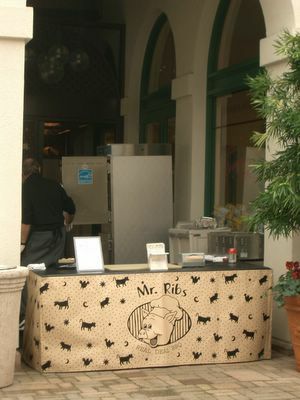 You can, of course, because Mr Ribs, with his own on the premises smoker, has set up shop in town. Is Marin ready for something so stinky? 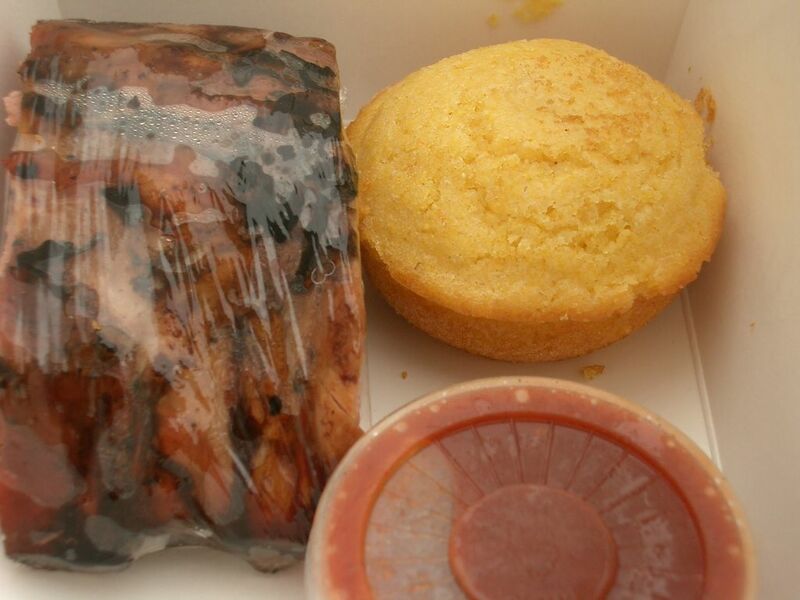 Is Marin ready to eat out of takeout boxes, using their fingers, without a bib? The two small ribs were the best part of the meal, lightly smoked, served warm, although wrapped in clingfilm (remember to remove before eating). This meal is difficult to consume and messy. I could still smell the smoke on my hands hours after lunch, despite the lemon wipe they provided for cleaning up afterwards. The corn bread was something I didn't like. I am take it or leave it with cornbread. Some I prefer more than others. This version was too "steamy" for my tastes. The sauce - was cold. Very cold. Too cold. It was a bit of nothing sauce, with meager personalitiy. Next time we visit Mr Ribs, Fred and I will give the multi meal option a miss. Instead we'll share a half slab of the baby back ribs for $9.49 and buy a tub of the old fashioned potato salad from Bryan's Fine Foods, as a side, instead. A good friend told me about Mr Ribs about a month ago. She's a Southern food writer and she said the meat pretty darned good. She was less enthusiastic about the sides although she didn't say they were bad. YUMMMMM. I go to Meathenge and he's all about pork, I go to you, Sam, and you're all about pork. And I go to India where I'm not going to be eating any pork for awhile. I read your entry and made little groaning sounds of pleasure. Go Baby Back! HAHAHHAHAHHAHAHHAHH, ya know I had the same comment about the sauce & muffin as I was reading your post along with viewing the picture. The color of the sauce is off. There's no love there. I'm a from-the-South food writer in Marin. Glad to see we agreed on the foods at Mr. Ribs. I like to buy the ribs or pulled pork, take them home and use my homemade Georgia-style sauce on them. Can't imagine trying to eat them in Town Center, lemon or no. Nice to buy from him on Wednesdays when the Farmers Market is there. I'm nervous having a professional writer visit! I'm even happier we agreed about the ribs. I have barely any experience of authentic Southern food, so I am glad you agree that our intuition seems to have been an accurate appraisal. Mr. Ribs is gone and Bryant's are doing their own. Skip them - they are fatty. Good slow-cooked ribs should have no visible fat - it should have rendered out in the long, slow process. Bryant's just doesn't get it.